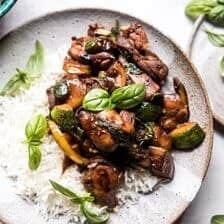 Easy 3 Cup Chicken with Zucchini. For as simple this easy 3 cup chicken with zucchini is, I sure made it a lot of times before finally sharing it with you guys. Sometimes I have recipes that need reworking and I have to make them over and over until they are just right. Sometimes I have recipes that stump me photo wise and I have reshoot them…and reshoot them. 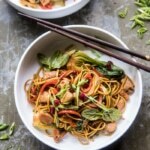 Some of these “tricky” recipes you never see, but sometimes they’re so good that I just have to get them right, they are just too delicious to let go. Both the recipe AND the photo portion of this easy 3 cup chicken recipe needed reworking, but it was so worth it. This is one of those recipes that you should totally have in your back pocket as a go-to quick and easy dinner. 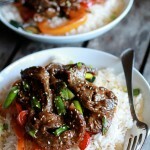 It’s healthy, quick cooking, and pretty delicious too, especially when served over a bed of rice. You know the funny thing about this chicken? 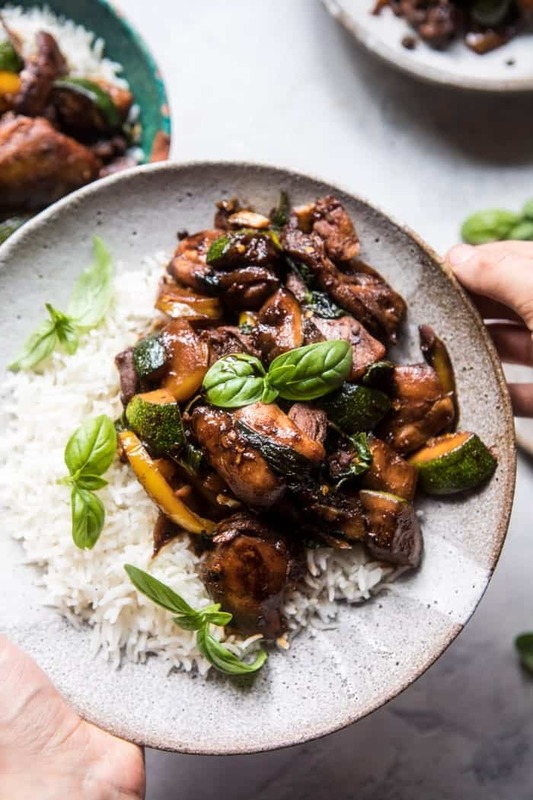 It’s a classic Taiwanese dish that got its name, 3 cup chicken, from the ingredients in the recipe. Supposedly, 3 cup chicken should be made with equal amounts of soy sauce, rice vinegar (or Asian cooking wine), and sesame oil. I’ve personally never seen a recipe that follows this, probably because the portions would be very off if you used one cup soy, one cup rice vinegar, and one cup sesame. I mean, whoooaaaaaaa. That would be a lot of sauce, you know? So maybe my recipe isn’t as traditional as it should be, but I promise, it’s still pretty dang good. Therefore, instead of a 3 cup chicken, this is more like a 1 cup chicken…but it is still divided into 3 somewhat equal parts. 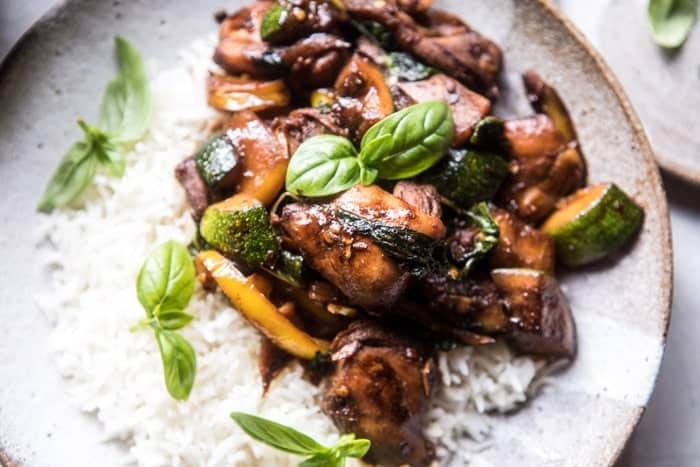 The rest of the ingredients include plenty of ginger and garlic, and then a ton of basil…which you guys know I love. Traditionally that would be all the contents of the recipe, but because it’s summer I really wanted to throw in some summer veggies. 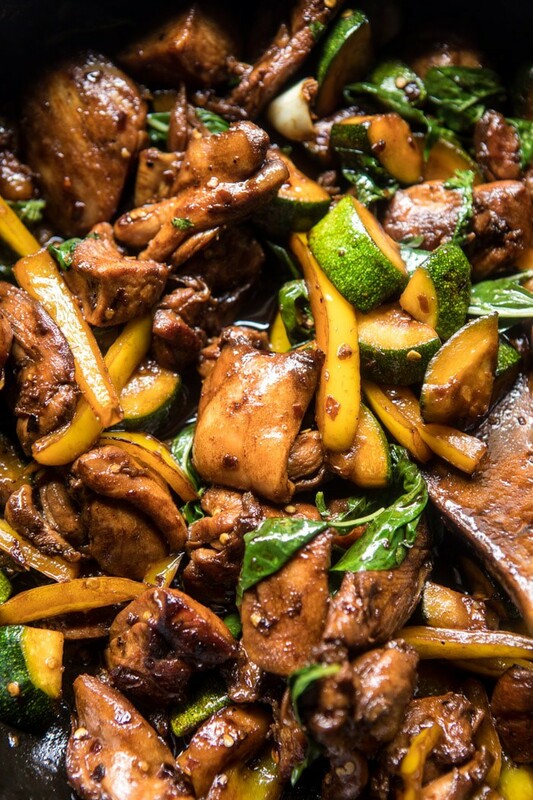 I went with zucchini and bell peppers and turned this chicken into more of a stir fry…which I used to eat often as a kid, so for me, it’s kind of a comforting dish as well. 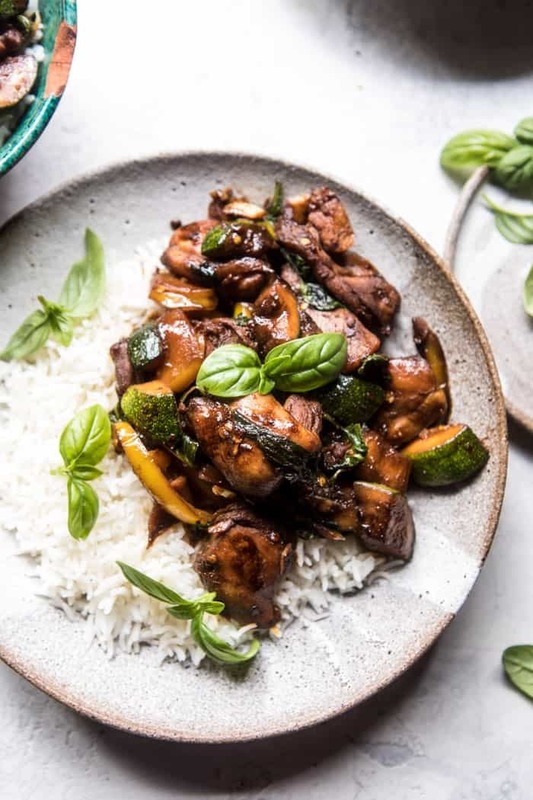 Serve this chicken over rice and you’ll have the an awesome under thirty minute dinner, perfect for busy nights! I’m going to make this for dinner tonight, after our return home from our visit to Ohio. I have all the ingredients in my fridge, so it’s pretty much a no brainer. It’s an easy, comforting dish that I know the family will all love. Speaking of Cleveland, thank you all so much for the kind comments and emails over the last week. My mom has been reading them all and is so appreciative, me too! My grandma’s service on Monday was beautiful, and thankfully my little part in the service was well received. I was happy that I could bring back old memories for everyone and say a proper, loving goodbye to my Nonnie. It was really nice to be back in Cleveland with family, but I’m also happy to be heading back home, and hoping life will restore to a bit of normalcy again. Please forgive me if you guys have been commenting and emailing with zero responses. We are working on getting back to you all very soon!! 1. In a small bowl, combine the soy sauce, rice vinegar, and 2 tablespoons sesame oil. 2. Heat a large skillet over medium high heat and add the remaining 2 tablespoons sesame oil. When the oil shimmers, add the chicken and cook, stirring occasionally until the chicken is cooked through, about 8-10 minutes. Add the ginger and garlic, and cook another minute more. 3. Pour in the soy sauce/rice vinegar mixture and toss in the zucchini and bell pepper. Cook until the sauce thickens and coats the chicken, about 5-10 minutes. 4. Remove the skillet from the stove and stir in the basil. Serve over rice. Enjoy! 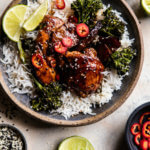 30 Minute Teriyaki Chicken with Sesame Ginger Broccoli. Love this recipe! Simple and so delicious. Perfect crazy weeknight dinner! Thank you Debs! So happy you like it! I’m confused. 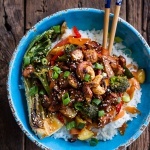 What is the “stir fry sauce”? You say to pour it in but unless I’m missing something, it’s already in the skillet, no? Love your blog! Step #1 in a small bowl is the stir fry sauce that gets added to the chicken in Step 3. This looks fabulous – can’t wait to try it. I hope you love it Rose! Thanks! Yes! That will be great! I would warm slowly on the stove. Let me know if you have questions. Hope you love this! What a good idea! Sounds delicious! Is the last tablespoon of sesame oil supposed to be added before serving? Also curious if there needs to be a cornstarch slurry or something added to make the sauce thicken? Looking forward to trying this! Hi! Yes, add the last tablespoon before serving and no slurry is needed. Please let me know if you have other questions. Thank you! I made this last night and it was delicious! 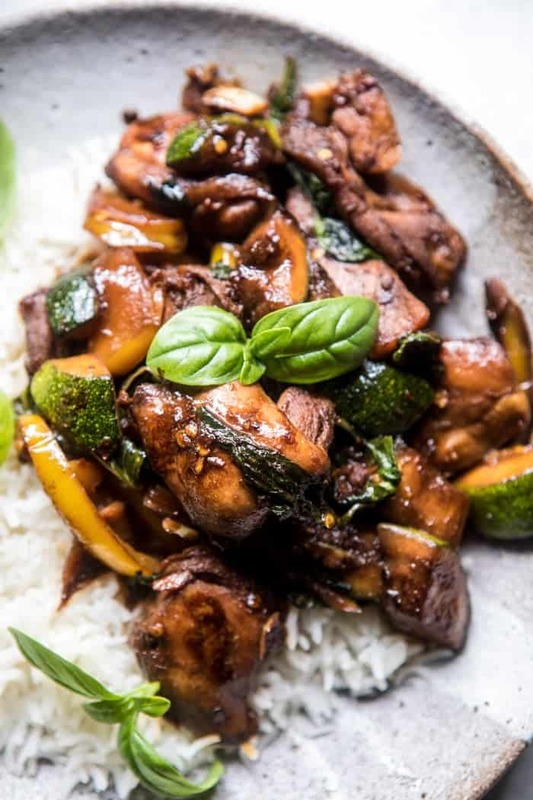 I used coconut aminos instead of soy sauce and it turned out perfectly! Great flavor and came together quickly. I am thrilled you loved this Serena! Thank you so much! We used a cornstarch slurry to thicken. Also, chilli flakes listed in the ingredients but not in the recipe. We added them to the sauce. Served over noodles and the sauce coated them perfectly. Delicious! I am so happy you loved this Brooke! Thank you! Hi Deborah, I like to use low sodium soy sauce, which I believe is light say sauce. Please let me know if you have other questions. Hope you love the recipe! This was awesome! Added baby bellas and served over noodles. The basil was such a nice touch! Thanks Natalie! So happy you enjoy the chicken! AMAZING!! I forgot and put in regular soy, eek! salty. Despite, this is our new go to favorite. I am glad you still enjoyed this! Thank you Jen! !